OUR PHILOSOPHY: It is our goal to provide each swimmer with a consistent swim program that will help them become a lifelong swimmer. Swimming is not focused on one meet or one time goal; we believe that doing the right things all the time is better than over-focusing on one meet or time standard. We coach every swimmer; whether the athlete is in lane 1 or lane 8, they should expect the same time and attention from our coaching staff. Swimmers are to do all of their training with our coaching staff; we do not allow swimmers to work with coaches outside of our staff, including parents. If you want to coach your swimmer, please choose another team. It is ok for swimmers to swim with another team when they are out of town on vacation. Let our staff know if you need help finding a team in this case. Parents, please watch practice from the bleachers and do not speak to the coaches or the swimmers during practice. At swim meets, cheer for your swimmer and leave the coaching to the coaches. Practices/Tryouts: Swimmers are to arrive on the deck 5 minutes before they are scheduled to get in the water; this time is to be used for pre-swim stretching, socializing, using the restroom, getting equipment ready, etc. It is expected that every swimmers is ready to go for the warm-up send off. 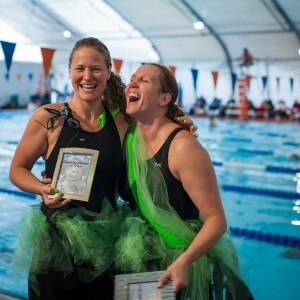 Bring proper equipment– Team Swim Cap, goggles, fins, kickboard, buoy and mesh equipment bag for all swimmers, plus a swim snorkel for swimmers 11& older. Swimmers in Junior 3, Senior 2, & Senior 3 are also required to have paddles, and a parachute or dragsox. Between Swim Outlet http://www.swimoutlet.com, Swim 2000 http://www.Swim 2000.com, and the front desk, you can find the equipment your swimmer needs. Boys need a suit for practice and a fitted racing suit for all swim meets. Girls need a one piece suit for practices and another tight fitting one-piece suit for all swim meets. At meets, swimmers can only wear suits that are Black, Green, or Black & Green. It is best not to wear the same suit for practice and meets, because swimming in a racing suit at practice makes it fit too loose for effective competition. Most of the swimmers like to wear a team suit at practice, so it is best to have 2: one for practice and one for meets. (You may opt to order a LaCamas HeadHunters custom team suit at http://www.agonswim.com. To find our custom suits, pick order by Type, then Team, then LaCamas Swim & Sport.) Purchase your team neon green swim cap when you register at the front desk. REQUIRED FOR ALL SWIM MEETS!!! Swim Meet Information: The Meet Schedule is posted online before each swim season. This schedule can be viewed on the website at www.lacamasheadhunters.com. A meet sign up email will be sent to each family before the sign up deadline for each meet. Parents are responsible for replying to this email by the deadline on Sign Up Genius. The coach will then enter the swimmer into events and subtract meet fee charges from the meet fee account. Communication for the team: Communication is all online or via email: Feel free to email your coaches if you have questions, concerns or a great idea: headhunterswimcoach@gmail.com. The team’s practice and meet schedule is on our website: lacamasheadhunters.com. MONTH TO MONTH SWIM TEAM PLAN OPTION: If you prefer not to join the team with a 12 month commitment, we offer the following option. Pay a joining fee then your coaching fee will be collected each month, until the Swimmer’s guardian cancels the team membership by giving a full month’s written notice at the front desk (which will include one more billing cycle). For your convenience and to keep coaching fees as low as possible, monthly coaching fees are collected via automatic bank draft (EFT) payment method. Swim Team members may elect to have dues collected from VISA, MasterCard, Discover, or American Express credit or debit accounts. If, for any reason the payment is not received by the 5th of the month, a late fee of $20 per month will be charged. Swim Team memberships may be “Frozen” for a nominal fee, with dues payments suspended while the membership is frozen. Be sure to fill out a freeze form by the 25th of the month before the month(s) you want to freeze. Swimmers who chose to cancel will be charged a rejoining fee when they return. 12 PAYMENT COMMITMENT/PREPAY SWIM TEAM PLAN: The 12 payment/prepay plan is a one year (Termx12) minimum agreement. If the year payment is split into 12 payments, the swimmer pays a little more than when it is paid up front. After 12 months the swimmer’s membership from the team automatically renews at the Month to Month Rate. If a swimmer is moved up to another swim group during the prepaid year, they will be credited for the months remaining on the contract toward a new termx12 agreement. In general, there are no refunds for prepay accounts. Exception: The swimmer moves their permanent residence more than 25 miles from the facility; in this case, a cancellation fee will apply. Commitment memberships may be “Frozen” for up to 3 months/yr for a nominal fee, with the frozen months added to the end of the contract. If you are a club member of LaCamas Athletic Club, you will get a 25% discount from the above prices. Why do I need private lessons? Lessons held in our indoor recreation pool, heated to 87 degrees. 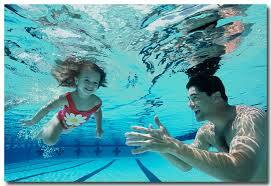 Level 1-3 lessons held in our indoor recreation pool, heated to 87 degrees. LEVELS PS 1, SA 1 & Parent/Tot available 1 day per week on Saturdays (30 minute lesson) 1 time per week for 4 weeks + entry to one public swim each weekend (4 total). Lessons are only listed on the session starts dates. Swim Team: Our youth swim team is for qualifying swimmers age 6-18 years (Swimmer must try out for swim team; swimmer will be asked to demonstrate front crawl, backstroke, breaststroke & butterfly plus flip turns and dives.) For more information on our USA competitive team, pick up a Swim Team brochure at the front desk. Triathlon Swim Skills: This class is designed specifically to help the swimmer swim fast, efficient, confident freestyle in open water. Sighting and drafting are just two of many skills taught. Masters: This is our adult swim team. All swimmers, ages 19 and up, are encouraged to join. For more information, pick up a swim team brochure at the front desk.